British Columbia’s premier John Horgan hinted that next year the government will introduce a requirement that all new light-duty cars and trucks sold in the province must be electric (zero-emission vehicles) by 2040. To help achieve the goal British Columbia intends to expand fast charging network and spend an addition $20 million CAD ($15 million) on plug-in incentives. Currently, consumers can get $5000 CAD for BEV and PHEV, while the purchase of FCV is granted $6000 CAD. Quebec, on the other hand, targets 15.5% share for zero-emission sales by 2020. 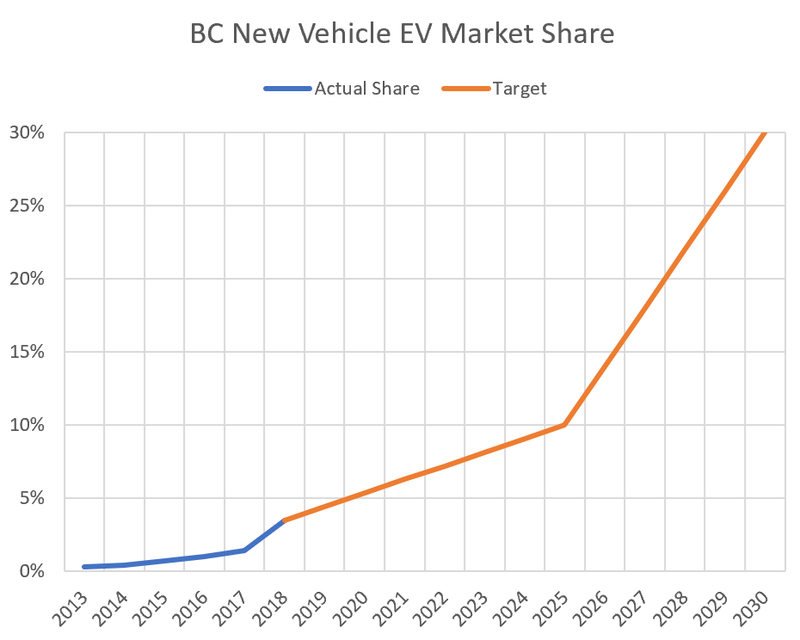 47 Comments on "British Columbia To Phase Out Non-Electric Car Sales By 2040"
It will take a large investment to build the EV charging infrastructure throughout BC. By which I mean you could drive to Prince Rupert in an EV with 200+ mile range. The next phase is to build up the center of the province. Yeah whatever. Next govt comes in changes it or the Federal govt makes a change. Fine to have targets but they should be reviewed every 5 years for relevance. Obviously good to get chargers available as a pre-cursor, just a question of who pays for them? Chargers are paid by Feds & Province. Do they mean banning all ICE, or just non PHEV/Hybrids? I’m guessing the latter rather than the former? Zero emission means all ICE. By 2040 of course there will not be any PHEVs/hybrids still selling in any significant numbers. But even then it is a pretty soft target. 100% zero emission by 2030 would be at least somewhat ambitious (not near the Norwegian 2025 but still). So no PHEV’s allowed in 2040? In which case it doesn’t match up with several of the countries on the list (the UK as an example) because those bans are only for ICE engines with no hybrid technology. Actually, I think that 2030 should be the accepted end of ICE sales, with the exception of off-road vehicles which are then series hybrids, but otherwise real EVs make sense for pure roads vehicles. In the end, I believe that by 2025, ICE vehicles will be the minority in new sales. In fact, I suspect that by 2022-3, that EVs will be over 1/2 of the sales (but only because customers will not be buying ICE; IOW, we will certainly see a MAJOR DECREASE IN TOTAL CAR SALES as demand outstrip supplies of wanted cars ). Considering mass production of one or two models of EV’s per company are only going to start in 2021 there’s no chance of that. VW is far and away further than pretty much any of the established manufacturers and they will only have three models on the market by that point (out of around 100+). 2025 may be possible if we include PHEV’s and mild hybrids, but unlikely if we’re just talking PHEV’s and BEV’s let alone BEV only. People are not going to stop buying cars because they’re waiting for an EV. Once consumers know the value of any new LICE car is decreased by the drop dead date for LICE vehicles, then they will stick with their current car, or a previously loved EV, while waiting for their new EV. Excellent move. Hope this will create more awareness and prompt people to buy EVs. Nice thing is we are already trending above the rate of adoption required to hit the 2025 target! Yes the 2025 numbers will be met far sooner. People will just buy them from another province and bring it into BC. No point, no one will want a ICE car by then. some will. Most will not want to own a car that has ZERO resale value. The LICE car you mean. The automakers will fight this hard. Too much money in ICE. And old men don’t change. they already are trying to fight this. BUT, china has hinted that they will cut ICE sales as well. If so, then it will force all car makers to follow suite. I’m all for more chargers. Vancouver just got a few Level 3 chargers recently, and just a few. The city needs way more. Not everyone can charge at home. if a city, locality really wants to push EVs, they really need to push level to the home esp apartments and rentals. A simple and cheap way to do this is require that when a tenant changes that a level 2 plug be provided (i.e. 240V/30+ Amps). As to owned homes, that is a none issue. Quebec also has a plan to phase out ICEs. I doubt if Alberta will ever ban ICEs so I guess I’ll have to move to BC to get clean air. Sooner or later, combustion cars will go away for reasons of economics and/or convenience, even without any bans. I feel your sentiment. I’m a second generation Calgarian and discuss this subject with my acquaintances frequently. Our population has been indoctrinated by 40 years conservatism (politically speaking), making changes such as this very difficult for the public to swallow. The sad thing for Canada is that after Ontario (well Toronto basically), Quebec (city) and Vancouver/Southern BC, Alberta seems to be the most amenable province for EV’s. Most of the rest of Canada is way behind. That is true, and it is the large cities that always lead change. It’s not clear if they incentive will remain at $5,000 or if it go up in the spring. Is it? The legislation will be announced in the spring session. Not a Canadian, but I think it’ll hurt EV adoption in Canada for each province to have its own separate transition & incentive policy. Having provinces coordinate policies as much as possible would make it easier both for EV vendors, as well as EV customers. BC, Ontario & Quebec between them, at 26M people, have the population of a mid-sized country, 75% of Canada’s. If they agreed on the same policy, most other provinces would have to follow. All three are similar in that they have a very large area, but most of the population is concentrated in a small part of it, and a very high renewable electricity generation (95%+ if we consider Ontario’s nuclear as renewable, which I think should be). That means they all have very similar motivation to get off oil (which none of them produce). By 2040, no one will even want to drive an ICE car. The goal of these policies is mostly sending a message to automakers to hurry it up if they want to stay relevant. That said, I will say this. California has had a policy that differed from the rest of the US. And that has helped the US as a whole since automakers didn’t want to make 2 different cars. So they simply complied with the strictest policy. As long as the policies don’t conflict with each other, there is no problems not coordinating. The extremely uneven distribution of population in Canada is going to be one of the major hindrances to an EV policy that includes then banning of ICE vehicles. Who pays for the infrastructure to cover all those roads that only see a couple of dozen vehicles a day, tens/hundreds of km from the nearest town/city? Just looking at Teslas Supercharger network shows the issue. Almost all of them are situated around and between Toronto and Quebec City, with a few more in and around Vancouver and a few more in and between Calgary and Edmonton. Sure, evenually they will cover all of the Trans Canada and it technically covers the majority of the population, but it doesn’t cover the other 95% of the country. Either we end up with vehicles that have extreme range (i.e. 1000km in summer), or we have to pay to provide significant infrastructure in remote areas to make the rest of the country actually accessible for people. So 95% of the country is inaccessible to anyone? You haven’t thought that through have you. People go to those places now, and will continue to want to go to those places then. Not everyone lives in a city and never leaves the local area. Put down the crack pipe wavelet….nuclear power is not and cannot be a “renewable” energy source. In fact nuclear power is a very costly and unsafe power source when calculating the security measures that must be implemented to safeguard those targets of terroism in the decades of power generation and the many more year of nuclear power plant decommissioning and highly radioactive nuclear waste material for centuries. Nuclear power is a numb scale power source any way one looks at it especially total lifecycle costs. Use your namesake for power new, renewable never ending power generation, wave tech, as well as solar, wind n geotehermal. quite calling it renewable and call it CLEAN. Nukes are not renewable, but they are clean and should be considered as a top option, along with geo-thermal and hydro. Large scale hydro is extremely environmentally damaging and quite often never pays back the initial investment. It’s one of the reasons for the massive decline in Salmon in Canadian rivers for example. Small scale hydro is better, but it costs a lot and isn’t going to satisfy Canadas thirst for electricity. Geothermal only works in some locations and requires lots of wells and fracking to do. Wind is reasonable, but not hugely reliable (better so if we can come up with cheap non hydro storage). Wave and tidal obviously only work in locations with a large lake or coastline and are still in the experimental phases. Unfortunately the push by governments for tidal seem to be the large scale type which have all the drawbacks of large scale hydro (massive initial investment and major environmental damage). Small scale tidal and wave is likely to be good, but may cost a lot to look after. Everything has it’s positives and negatives, it just depends on which you personally value highest unfortunately. Excellent. With high insulation, high efficiency then SunPower solar PV rooftops along with electric vehicles BC can increasingly become self powered. Electric radiant floor heating is also nice, even heat and silent once high insulation is installed everywhere. Im pushing several bills in Colorado, but one of them is to require that all new buildings of under 6 stories to have enough on-site unsubsidized AE so as => the energy used by the HVAC. With this approach, a builder will likely choose Solar, but then can choose to add better insulation, LED lighting, better insulated windows (esp. using Aerogel) and ideally geo-thermal HVAC. This will enable most buildings to add 1-5 solar panels and meet the definition. Of course, if a buyer has everything in place and only has to pay to add more solar panels to provide electricity for their building and car, then hopefully, they will do so. BUT, at least, this gives options. It is just better to have a per-mile tax. For passenger vehicles, we should require for the first year that all pay say $150 tax with the license, but also give the mileage. Then at next year’s licensing, require again giving mileage and then adjustments are made to tax, along with the base tax for that car. For commercial, require it monthly. It seems to me that by 2030 all developed/semi developed countries would have a ban on ICE cars sales, with a target date of 2040 or earlier. However, by 2035 at the most (hopefully earlier), EVs would be cheaper to buy and operate, so there will be no practical reason to buy an ICE car. SOME EVs are already cheaper to buy/operate than comparable vehicles. Model S/3/X are cheaper than comparable models to buy, and certainly cheaper to own (though I will say that our MS insurance IS HIGHER than comparable ICE vehicles; not happy about that). BTW- this was just the announcement, or a ‘statement of intent’. The actual legislation won’t be tabled until the spring session, so much can change/improve in the meantime. I have no doubt that whatever legislation is proposed will pass since 2 of the 3 parties in the Legislature support this announcement and have the votes to make it happen. Regardless, this is very good news.